I never complained about this summer’s heat. It’s a memory I’ll need some cold, damp, March afternoon when I’m half way between this summer and the next one. I opened my mind to the sun light and tried not to think. Appreciating the last of this summer has led me to post something requiring the least energy possible. This homemade/handmade sign provides a valuable public service. 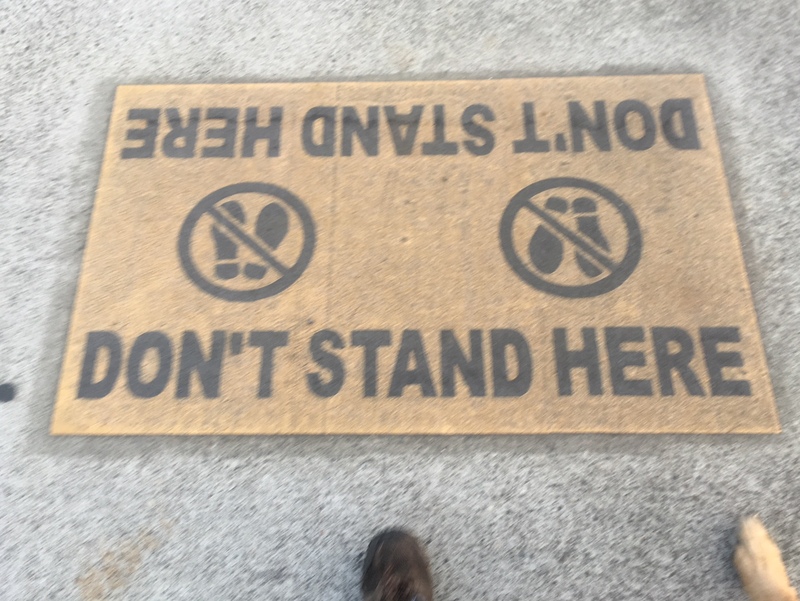 Placed on a side door of a bar on North Lombard Street, the message could become more confusing as the night wears on. 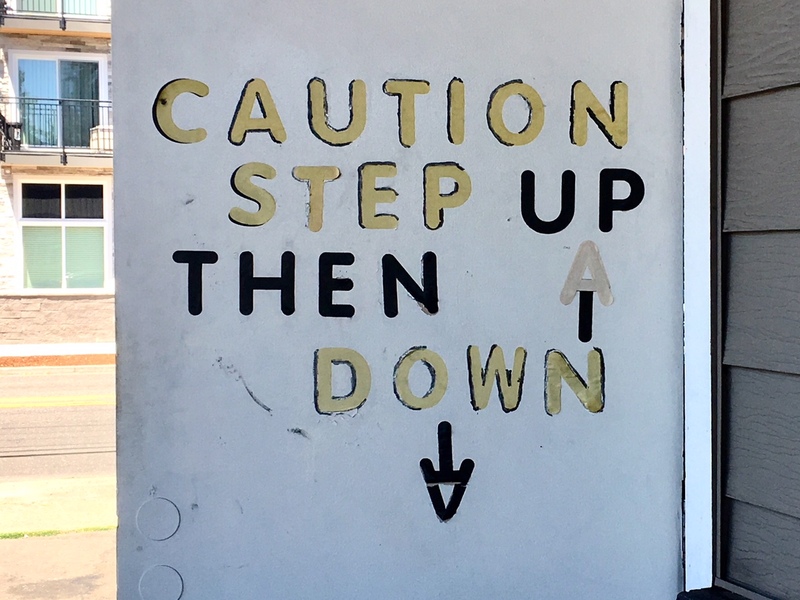 The caution warning alerts people to the need for the tricky two step dance necessary to get through the entrance. 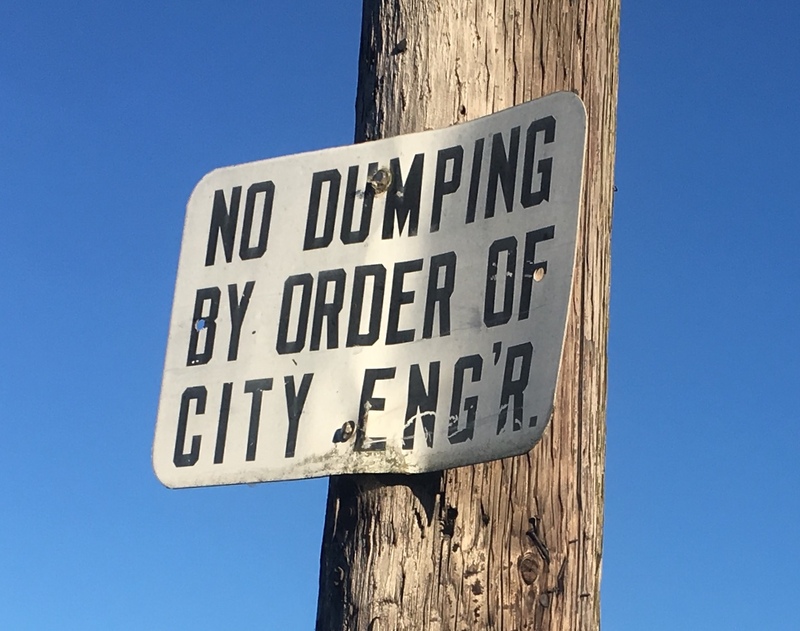 No Dumping By Order of City Eng’r. This sign caught my eye on Willamette Boulevard. The road is on the top of a sloping hill that runs down to an industrial ravine. It’s sure to tempt polluters or anyone who needs to dump something in the underbrush. I found amusement from the sign’s need to include a mention of the City Eng’r (City Engineer?). It’s tough to tell if this is an intimidating enough authority figure to get people to heed this warning. I don’t doubt there’s a need to warn people to watch out for pedestrians on this tricky corner of the St. Johns neighborhood near the bridge. 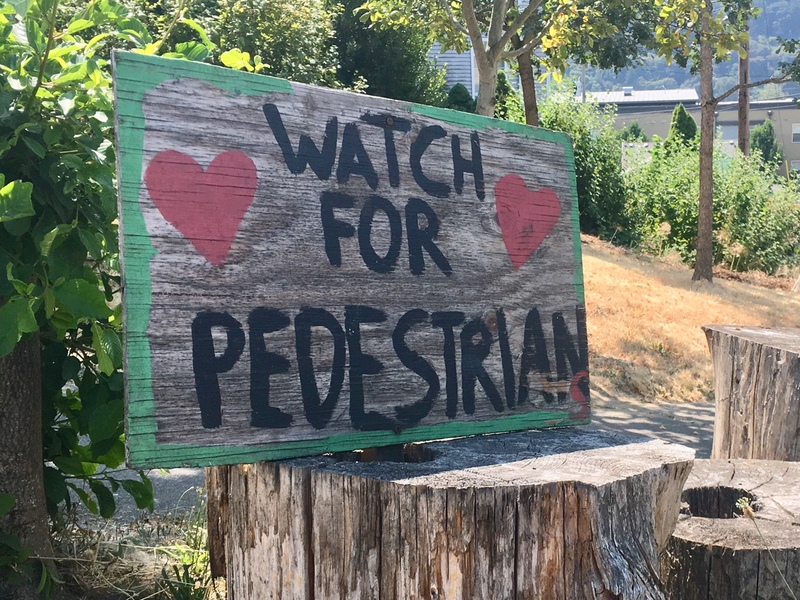 I couldn’t tell if this was poor planning on the part of the sign maker or if there are fewer pedestrians than one would expect. 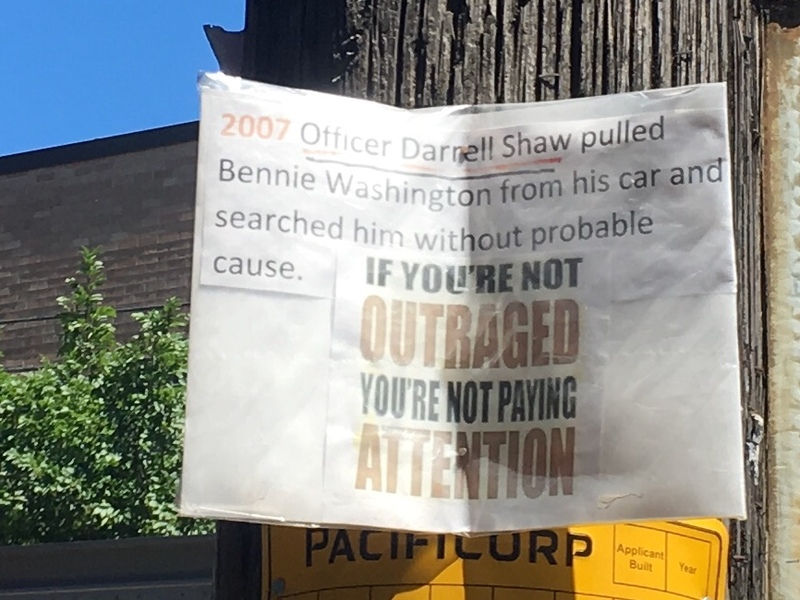 I don’t know the history of this incident but it’s worth noting that this sign spotted near the Lloyd Center has either survived since 2007 or someone continues to bring attention to the situation. The outrage feels never ending and the reminders always necessary. 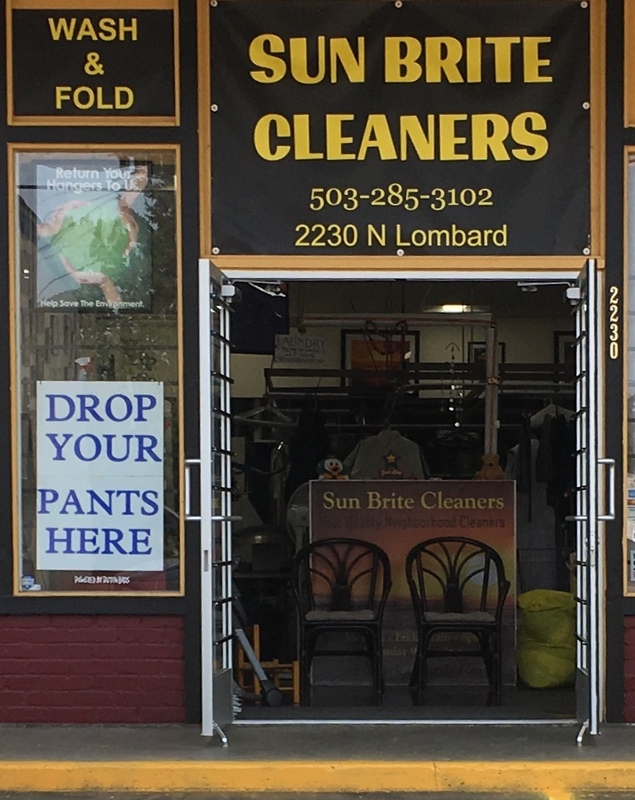 In the days of #metoo, this sign seems a bit crass but it’s the nature of this dry cleaners to risk letting the world know they have a sense of humor because, well, they spend their work days in the confines of a dry cleaners. It’s nice to try to loosen up a little bit although not to the point where one takes the sign literally. If the photo looks a bit too much like an advertisement I can attest to the work they do, which is, pretty good. Not so much a sign but a message applied to a garbage dumpster in the Kenton neighborhood. 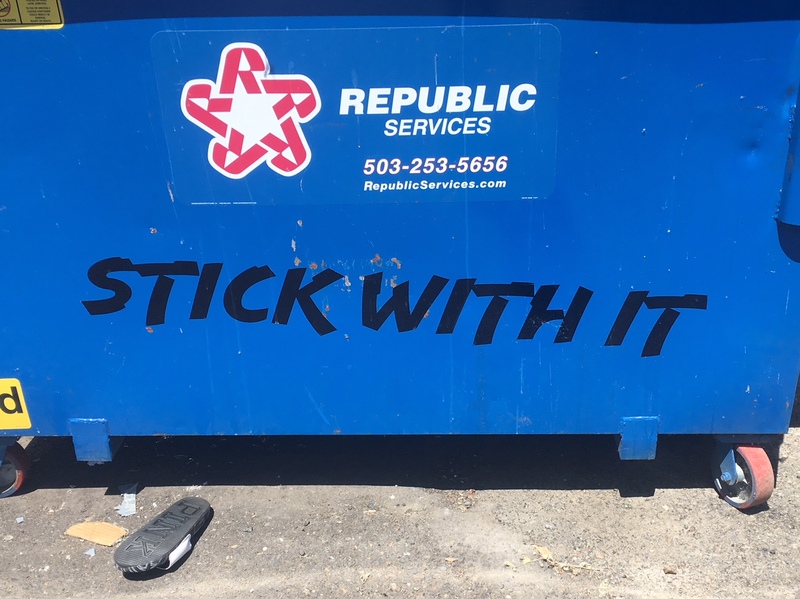 Anyone seeking out inspiration on a dumpster would usually be out of luck but a trash receptacle bearing this message has a certain inspirational quality not usually found on dumpsters. Having spotted this next to the curb on the outskirts of Kenton, I assumed the sign was staking out parking territory. 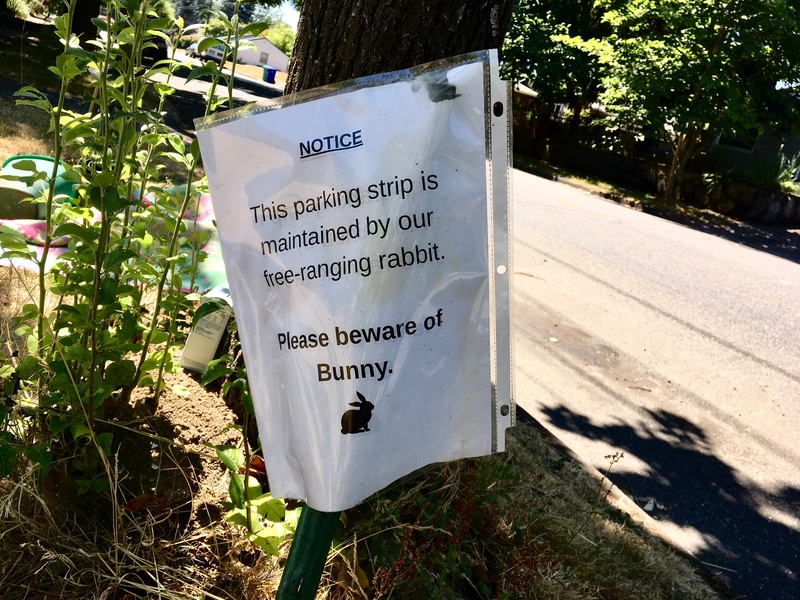 Seeing it up close, I was surprised to learn about the parking strip maintainence performed by a free-range rabbit who’s whereabouts were unknown at the time I took the picture. I’d say only Jimmy Carter should heed a beware of Bunny message. My preference would be to remain mindful of the rabbit’s maintenance munching. Oh to the ad campaign that lunched a thousand, or more, parodies. This one is funny to a certain someone I know. 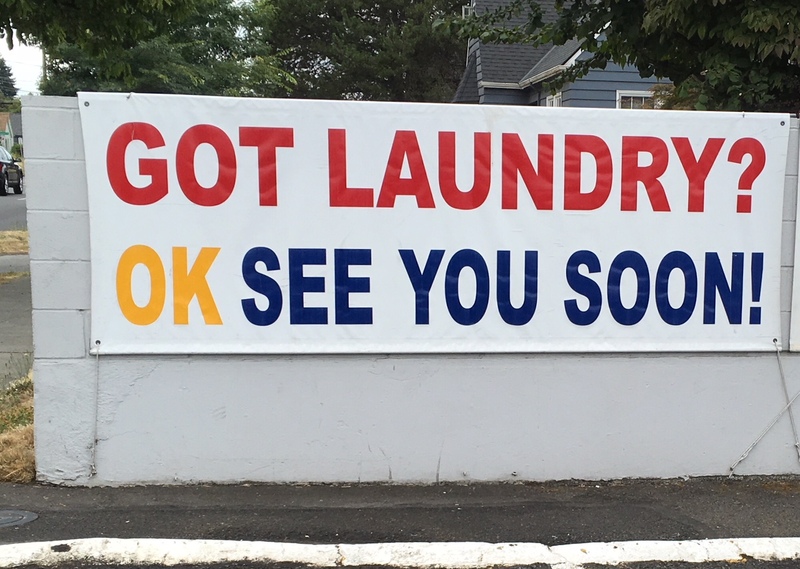 It seems to be trying to remind people driving down North Lombard Street to round up their dirty clothes and head back to the laundromat. 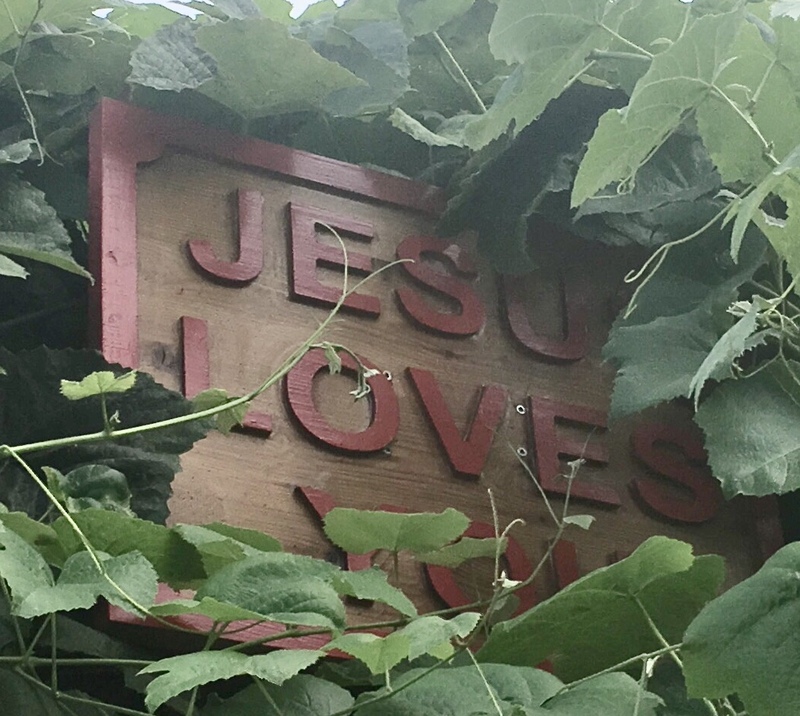 The grape vine obscures a handsome sign with an uplifting message spotted in the Kenton neighborhood. You can tell I didn’t leave the neighborhood much this summer. The sign may yet return to glory when the leaves die back. It’s a shame someone has to post this kind of message. It’d be nice to think that people could leave their stuff out and not have to worry about theft. Another sign of the times seen in the Kenton neighborhood. 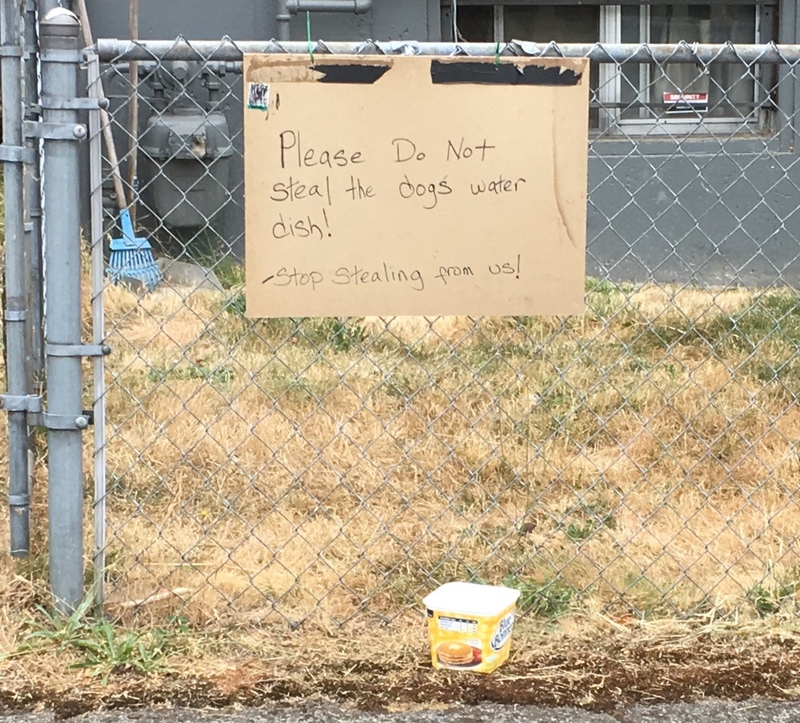 Please Do Not Steal the dogs water dish! 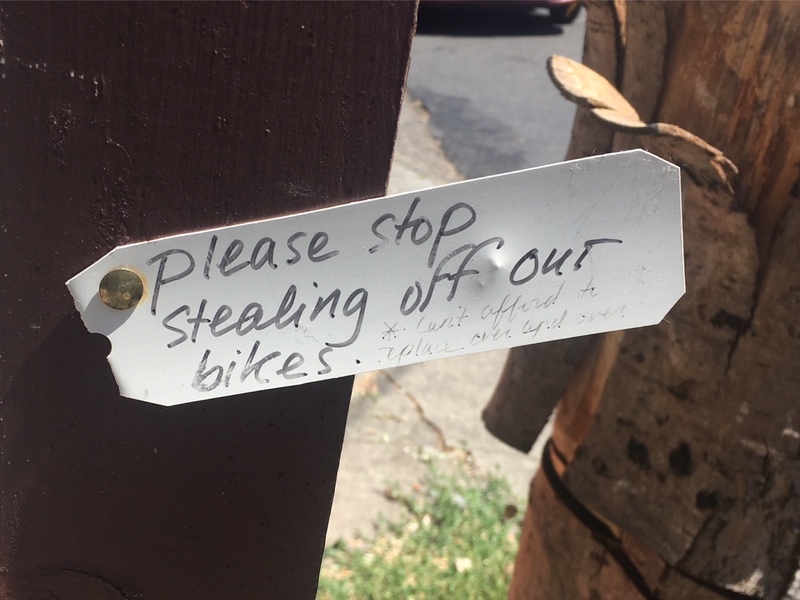 More theft to report, with this occurring down the road in a no man’s land between the Kenton and Woodlawn neighborhoods. It almost doesn’t matter what thieves steal. It’s always annoying. 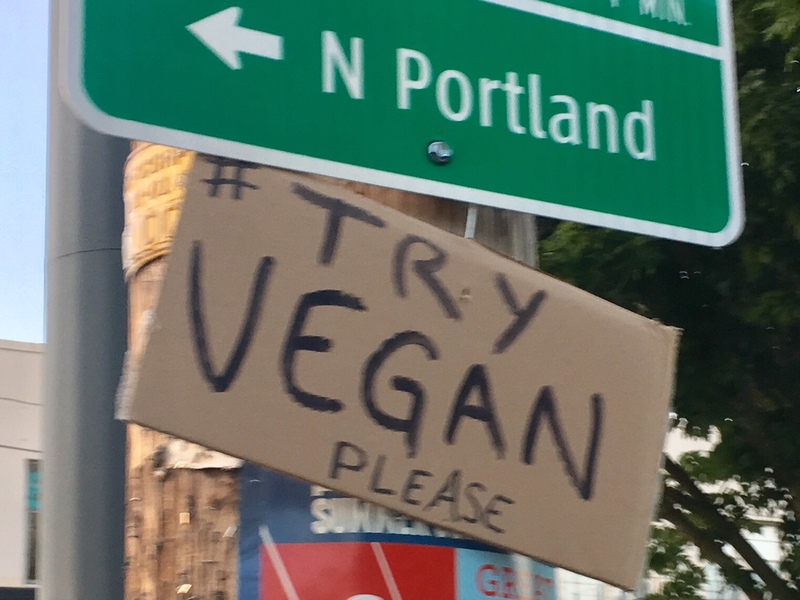 The camera optics at dusk aren’t always great but this is a cardboard plea near the Lloyd District that’s polite and offers a low frill, yet ultimately high tech way to explore the vegan lifestyle. Is the hash tag going to get you propaganda? Recipes? There’s only one way to find out. Sure it’s good information, a notice that surely has saved many lives. The sign straddles the tracks by the North Denver Max station. This blurry photo reveals that if you only stop for half a second, or less, you can get away with standing next to the sign without violating the sign’s strict request.